"How to Supervise People and Lead a Team"
Thursday, February 6th from 8:30 am to 3:00 pm. The seminar takes place at the Hilton Garden Inn in Temple on Thursday, February 6th from 8:30 am to 3:00 pm. If you’re a member of the Belton or Temple Chamber, you may attend this event at the special discounted price of only $197 ($247 for non-members). When 3 or more enroll, the 4th person attends for FREE. 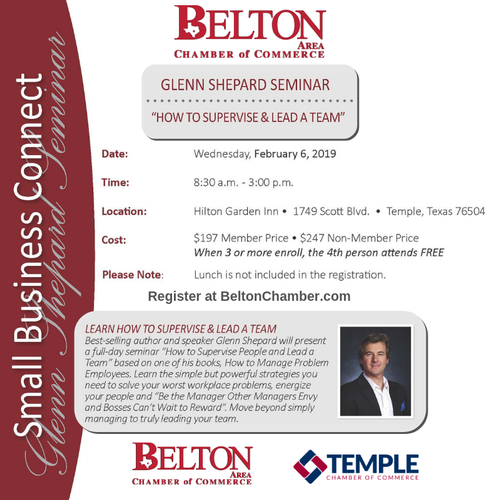 Glenn Shepard Seminars is once again providing you and your team an opportunity to take part in a special seminar offered to members of the Belton or Temple Chambers of Commerce. Best-selling author and speaker Glenn Shepard will present a seminar "How to Supervise People and Lead a Team," based on one of his books, How to Manage Problem Employees.